My Exchange 2013 SP 1 servers restarts frequently and don’t displayed a blue screen. The root cause from Exchange 2013 CU 2 was already solved in Exchange 2013 CU 3 so I have to investigate further. The CU 2 problem is described in the KB2883202 article. My environment contains a 4 node DAG with Exchange Server 2013 SP 1 based on Windows Server 2012. The Application Eventlog throws an error with the event id 1001 with the error message “Bugcheck 0x000000ef” and forces a reboot of the server. 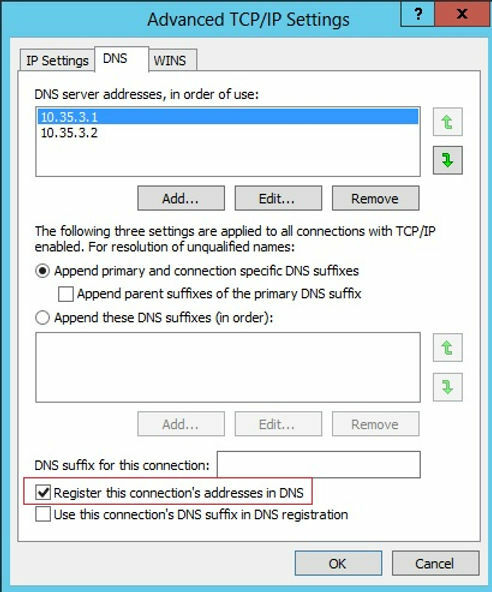 The root cause of this issue was, that one NIC of the Exchange 2013 SP 1 servers has multiple static IP addresses and I don’t configured “Register this connection’s addresses in DNS”. Enabled must be the value “0” (instead of 1). BTW: with Exchange 2013 CU 5, you can set the “Duration” parameter for a global override up to 365 days. It’s an alternative configuration for the parameter “ApplyVersion”. But this solved not all problems! For Windows Server 2012 / 2012 R2, it’s included in the PowerShell v3 command set. Take a look at the following blog post: http://blogs.technet.com/b/heyscriptingguy/archive/2013/01/24/use-powershell-to-change-ip-behavior-with-skipassource.aspx.